After the books, Selection from the Glorious Quran, Surat al-Hujurat and Nur-un ala Nur were well received by the students of Arabic, author was encouraged to write another book following the same pattern. 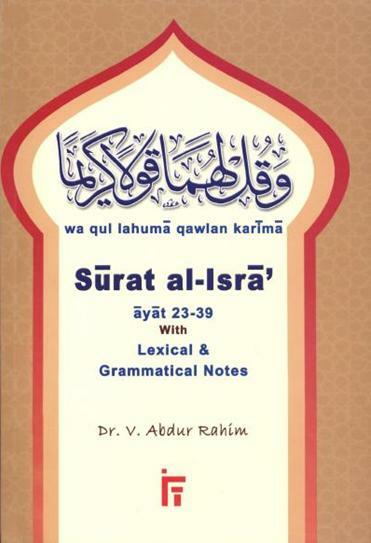 The result is the work in which author have chosen to present some ayat from Surat al-Isra with lexical and grammatical notes. A profound Qur’aanic selection whose aayaat speak of Allaah’s Greatness, Majesty and Divinity, promise and encourage believers towards greater iimaan and strike parables of unbelief with profound meanings. Two-tone colour print and top quality design.